As part of a beautification project, members of Norfolk's Redwood Junior Garden Club placed holiday boughs at Mission 22's War at Home Memorial. 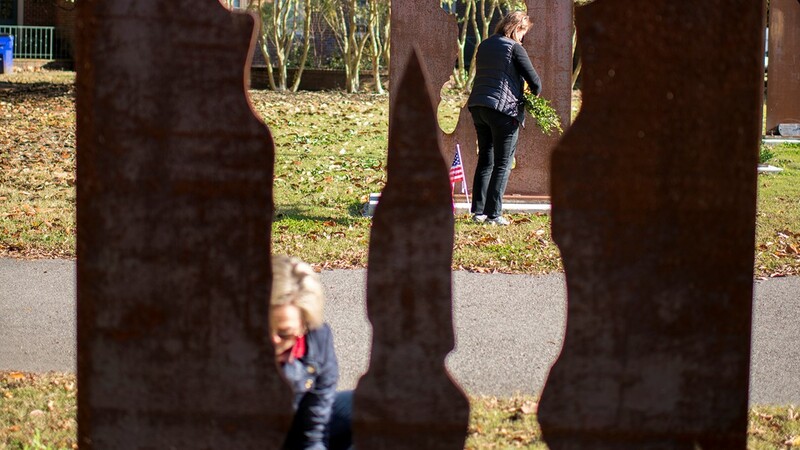 NORFOLK, Va. (WVEC) — Three members of Norfolk's Redwood Junior Garden Club placed holiday boughs at a war memorial Thursday. 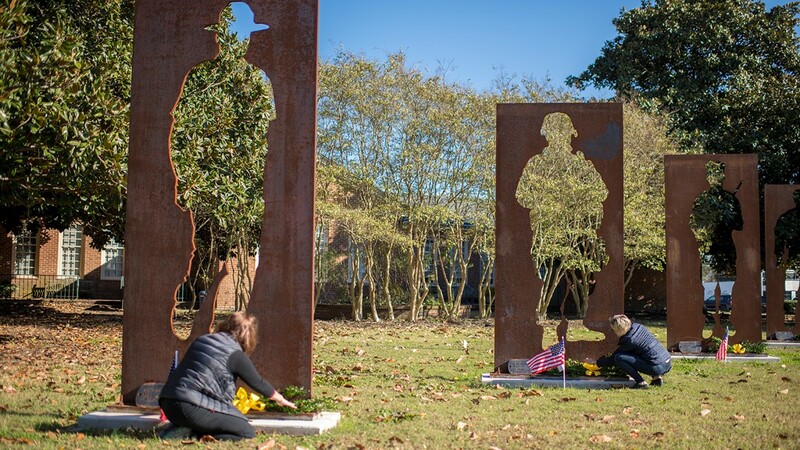 Carrie Short, Ellen Selig and Dyan Witt decided to make decorations for each of the 20 statues at Mission 22's War at Home Memorial along the Elizabeth River Trail by the Larchmont Library. 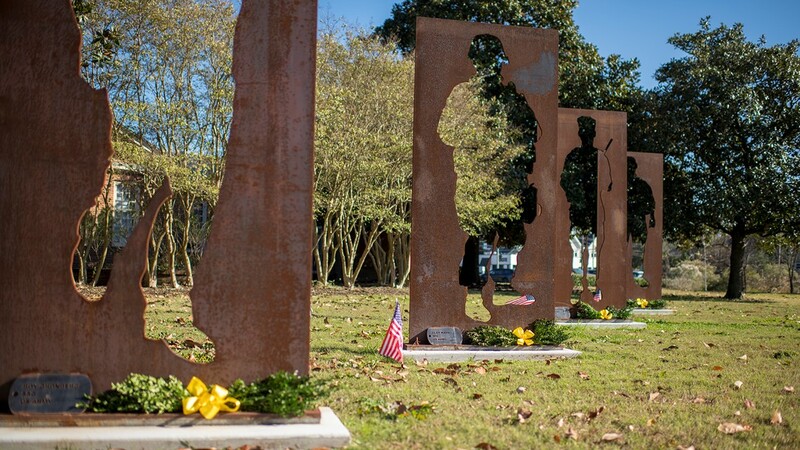 The greens will remain at the installation, which represents the 20 veterans America loses each day to suicide. Witt said she's a Navy wife and mother. So, she understands the significance of these 10-foot tall metal cut-outs. “Every dog-tag that you see, that’s somebody who had a mother and a father and children and a family," said Witt. 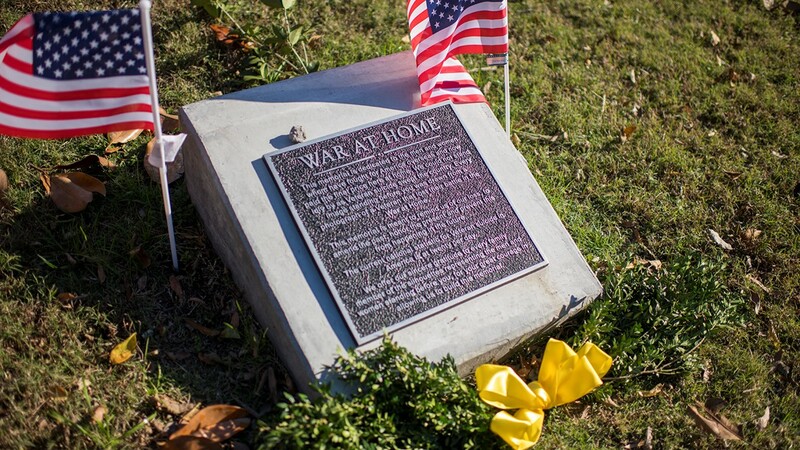 Mission 22's War at Home Memorial represents the 20 veterans our nation loses each day to suicide. 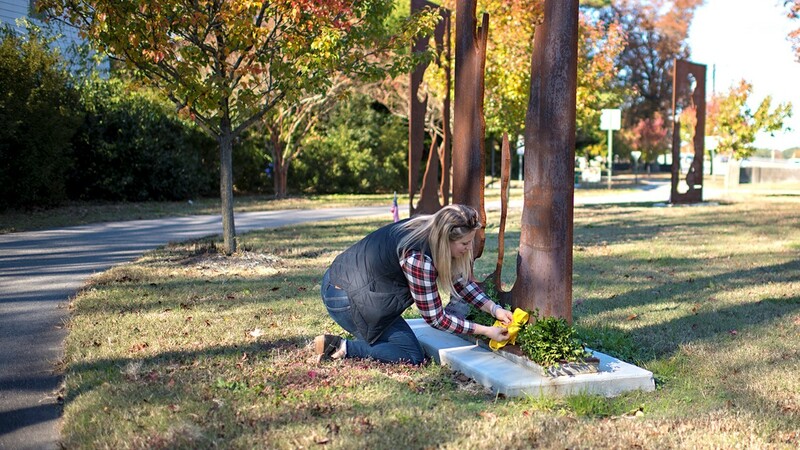 Carrie Short lays a holiday bough at one of the 20 statues at Mission 22's War at Home Memorial Thursday, Nov. 29. 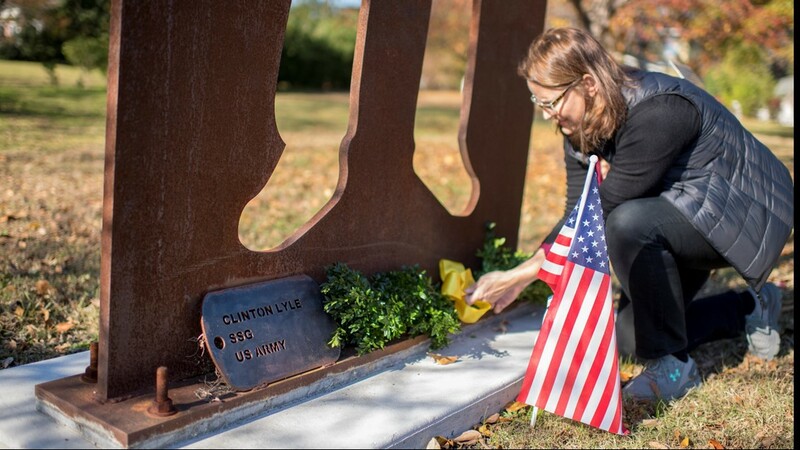 Ellen Selig lays a holiday bough at one of the 20 statues at Mission 22's War at Home Memorial Thursday, Nov. 29. Ellen Selig and Carrie Short lay holiday boughs at two of the 20 statues at Mission 22's War at Home Memorial Thursday, Nov. 29. 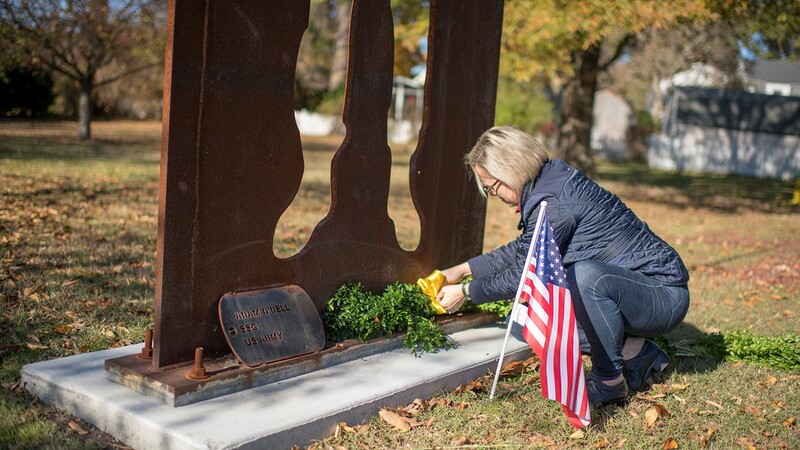 Dyan Witt lays a holiday bough at one of the 20 statues at Mission 22's War at Home Memorial Thursday, Nov. 29. Carrie SHort and Ellen Selig lay holiday boughs at two of the 20 statues at Mission 22's War at Home Memorial Thursday, Nov. 29. Members of Norfolk's Redwood Junior Garden Club placed holiday boughs on Mission 22's War at Home Memorial Thursday, Nov. 29. The holiday boughs are part of one of the club's annual community beautification projects, but Carrie Short said it's already catching the community's attention. “It was really sweet. We were out here and there were cyclists coming by, runners coming by saying oh thank you so much thanks for doing it," said Short. The non-profit Mission 22 worked for years to post these silhouettes, in Norfolk. If you'd like to connect with the veteran support organization, click here.